What are the Divorce Property Division Laws in Texas? Texas is a community property state. Divorce property division laws first require all property to be categorized as either community or separate property. Any complex property or business in divorce must be properly valued. Below, we explain the general differences between community and separate property. However, it is not always easy to categorize each property. In these instances, your attorney can help you determine which is which. Please note that contrary to popular impression, the Court does not have to divide community property 50-50. The Court may consider many factors when dividing community property. This may include disparity of income, education and training, health, age, fault in breakup of marriage, nature of property, custody of children and the parties’ capabilities. There is no way to tell how the Court will divide the community property – it is a gamble. 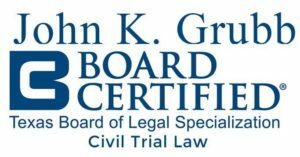 John K. Grubb is a Houston property division attorney. He can provide the expertise and resources you need to receive a fair division of property in a divorce. He is a high asset divorce attorney who is board certified in Civil Trial Law by the Texas Board of Legal Specialization. Additionally, he has an MBA in accounting and finance. Community property consists of property acquired by either spouse during marriage, other than separate property. Spouses must include all community property in the settlement agreement. The Courts presume that all marital property in Texas at the time of divorce is community property. Also, in some cases, a client may receive reimbursement claims based on economic contribution. What is Separate Property in Texas? Separate property includes any property that you can trace by “clear and convincing evidence” to one of these sources. The Court cannot award your separate property to your spouse or your spouse’s separate property to you. Spouses must also include separate property in the settlement agreement. If your case will not settle and it is necessary to try the case, then the burden is on the person claiming that their property is separate to prove it by “clear and convincing evidence.” You can accomplish this through proper asset tracing. Virtually every conceivable thing of value is considered property and, therefore, you must consider it in a divorce. If it has value or if it may have value, then you probably have to include it in the divorce. For many people, the major items included in the inventory consist of houses, cars, savings, stocks and mutual funds, IRA’s, 401K’s, 403B’s and pensions. It is usually easy to ascertain the value of these items. How is Community Property Divided in Texas? If you and your spouse enter into a written property division to split assets in divorce, then the Courts will approve the agreement. The settlement agreement must include all assets (house, cars, stocks, bonds, retirement, etc. ), and liabilities (mortgages, loans, credit cards, taxes, etc.). Need Additional Information About Divorce Property Division in Texas? Reach out to a Houston property division lawyer at John K. Grubb & Associates, PC if you are entering into divorce proceedings and have substantial and complicated assets or liabilities.